The idea behind Barcamp Open Science is to encourage dialogue about open science practices in everyday science. 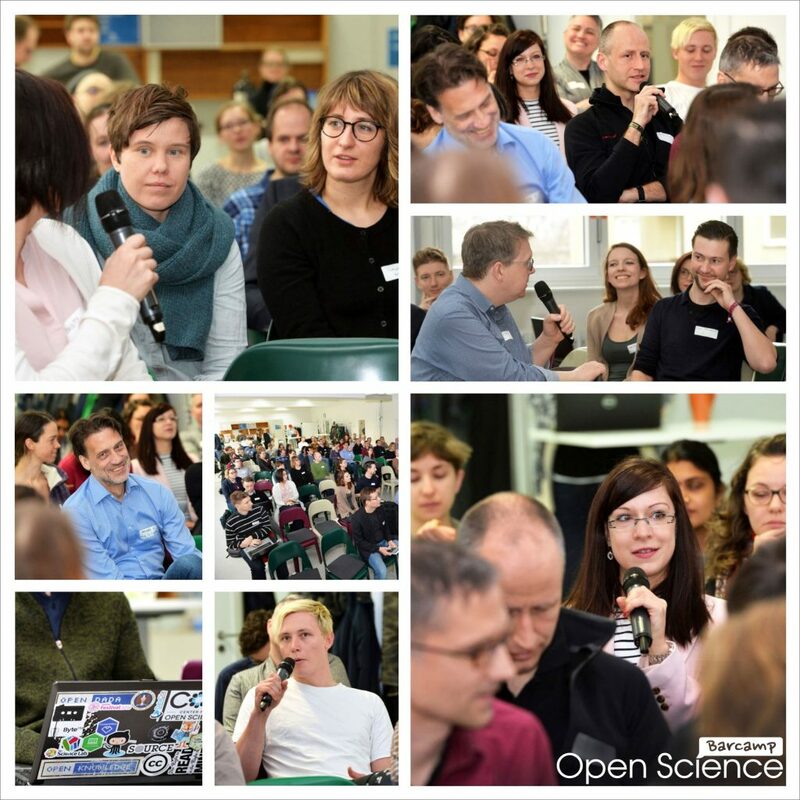 Everything from open science tools to incentives for opening up one’s own scientific practice were the subject of lively discussions in Berlin on 12 March 2018. Given that open science is a hot topic of conversation, is it also being put into practice? Open science has unfortunately not yet completely caught on, and the oft discussed cultural change is taking time. Often there is a lack of knowledge and orientation in the complex world of open science. That is why it is important to approach researchers, facilitate an exchange about practices and answer their questions. 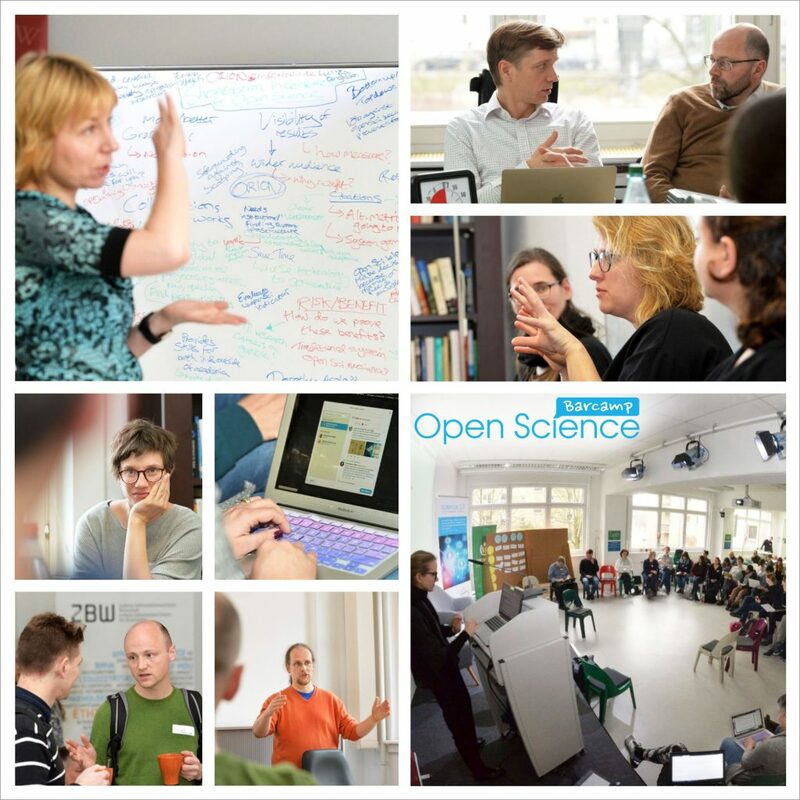 This was the focus of the fourth Barcamp Open Science, organised by the Leibniz Research Alliance Science 2.0 and held at Wikimedia as it was last year. Launched as a pre-event for the Open Science Conference, both events have firmly established themselves in the open science community. Barcamp was fully booked after only four weeks, and with 80 contributors from very different backgrounds it was very well attended. Many sessions were about looking at and reflecting on open science from different perspectives. This was often related to the question of how the topic can be brought closer to researchers. For example, in one session discussion focused on what is still preventing even open science savvy researchers from consistently implementing it in their own researcht. Essentially it is individual (competitive pressure, no trust, lack of knowledge) and structural reasons (no incentives, a lack of support, a lack of strategies) that are responsible. It is important to address both of these aspects. Events like Barcamp are particularly well suited to address individual factors, especially when it comes to a lack of knowledge. Ultimately, a basis of trust between all actors must be established in the science system. However, this is always difficult in a system “pressed for time”. As discussed in a session on this issue, open science should not only be perceived as a burden, but also as something that can be “fun”. In principle, it’s about added value, meaning faster and easier exchange with fellow researchers, better and faster feedback, the use of existing ideas and public recognition of research. The discussion about open science shows that openness has its limits and is probably not one hundred percent practicable. One session thus dealt specifically with identifying the valid reasons (such as data protection) for a so-called opt-out, i.e. not being (completely) open. The session collected a number of reasons, discussing some of them on site. A subsequent blog post (only in German) and an appeal were intended to stimulate continued discussion outside Barcamp. Further sessions dealt with motivation and incentives for open science, problems and disadvantages of transparency, Open Peer Review as well as the relationship between open science and human rights. Barcamp contributors ranged from beginners looking to learn more about concrete experiences and pick up tips on open science practices to the more advanced, eager to share their knowledge. It is thus gratifying that many sessions were again very practice-oriented, addressing everyday problems. Open science is already possible today, but you need to know how to put it into practice. A major and growing problem is disorientation in the tool jungle, for which a session on open science tools was offered. Another session looked at the topic of licences, in particular which licences are suitable for open science and which licences make sense for which cases. Specific tools such as Scholia for scientific profiles based on Wikidata, Open Knowledge Maps as a research tool and ORCID as a personal identifier of scientific authors were also presented. Interestingly, not a single session directly addressed the topic of research data, which is currently often the subject of discussion, for example in the context of “FAIR data”. One session grappled with best practices for the generation of metadata and a plugin for the “R language”, which is widely used in science to automatically generate codebooks based on metadata. There was also a focus on research software, including research data that should be publishable and citable as such. There were sessions that dealt with publishing and finding scientific software in relevant repositories as well as with the citability of scientific software and its recognition in the science system. Another block of sessions discussed the future development of an open science system. For example, there was discussion about the elements required for an open science indicator to measure the application of relevant practices and eventually integrate them into the scientific reputation system. The role of libraries in open science was also addressed. Given the continued absence – even with open access – of evolution/revolution in the scientific publishing system, which is still firmly in the hands of large publishers, one session discussed whether libraries should act as publishers and also have the competence to do so. In general, libraries should increase their proximity to the research cycle and build up appropriate services. This proximity to researchers as a central component of libraries, which is so important for the widespread implementation of open science practices, was discussed in a further session. Libraries enjoy a level of trust that corresponds to their status as independent institutions. They are seen as having the competence to build up apppropriate supporting structures. Another increasingly discussed topic is the decentralisation of the science system, for example with the aid of blockchain technology. Barcamp dedicated an “ignition talk” and session to the topic. The central thesis of the speaker (Lambert Heller, TIB Hanover): In the long run, it will not be enough for research data and publications to be only FAIR. Rather, innovative protocols based on technologies such as bittorrent and blockchain must be used to eliminate bottlenecks that should not continue to exist. There should no longer be any need for “trusted platforms”, rather all interested parties should be able to become co-owners and distributors of research information through peer-to-peer networks. Valuable transactions such as peer review and evaluations, in particular, should be conducted directly by the researchers among themselves and with the public. “Journal editors” and other “intermediaries” impede the exchange of information, making it fragile and non-transparent. According to Lambert Heller, publishers like Elsevier only exploit our (outdated) premise that science (including open science) is not possible without central platforms. “Journal editors” and other “intermediaries” impede the exchange of information, making it fragile and non-transparent. Publishers like Elsevier only exploit our (outdated) premise that science (including open science) is not possible without central platforms. Finally, there was a session on the public’s future role in research. In addition to targeted science communication, among other things to create transparency and promote acceptance, there is an effort to involve civil society more actively in research processes through what is referred to as “citizen science”. There are a number of projects on platforms such as “Bürger schaffen wissen” (Citizens Create Knowledge) (Germany) or “Doing It Together Science” (EU). Citizens often support the collection of data in the sense of crowdsourcing. There are also approaches that facilitate the involvement of citizens in other processes such as designing research projects, defining research questions or even data analysis. There is still a long way to go before open science practices become an integral part of researchers’ everyday lives. This became clear at this year’s Barcamp. It is all the more pleasing that Barcamp once again saw many new faces this year. It is this mixture of experienced pioneers and newbies that characterises the event. Despite the much-discussed gender gap in science, the relationship between male and female contributors was very balanced. 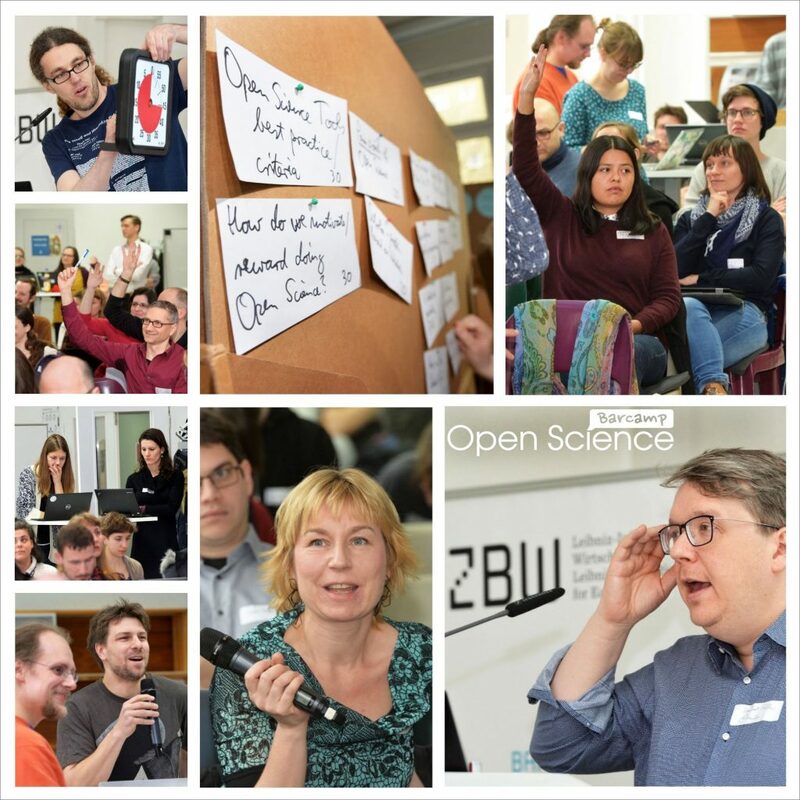 Missed out on Barcamp Open Science? No problem. All the sessions were documented in the Metapad. We were happy to see that the Open Science Radio team participated again for the third time, interviewing the moderators of the various sessions. At the end of the day one thing was clear: Formats like Barcamp are necessary to promote the exchange of ideas about open science in scientific practice, and we need more of it! Another Barcamp Open Science will therefore be held next year at Wikimedia in Berlin: 18 March 2019 (#oscibar)! And the Open Science Conference (#osc2019) will as always be held afterwards in Berlin on the following days: 19 – 20 March 2019. Authors: Lambert Heller | (Head of the Open Science Lab at the Technical Information Library (TIB), Hannover), Susanne Melchior | Coordination Assistant of the Leibniz Research Alliance Science 2.0 at the ZBW and Dr. Guido Scherp | Head of the “Social Media” department at the ZBW and Coordinator of the Leibniz Research Alliance Science 2.0.